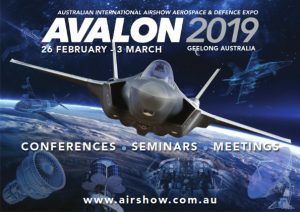 AVALON 2019, the Australian International Airshow and Aerospace & Defence Exposition, will be taking place from 26 February to 3 March, in Geelong, Australia. Avalon hosts multiple concurrent conferences and expo streams, across the spectrum of Defence, Airlines, Business and General Aviation, Airports, MRO, Space, Unmanned Systems, Air Safety and Ground Equipment. The trade days span from 26-28 February, followed by the public days from 1-3 March. See the complete Avalon Conference programme and view the Exhibitor List. Please register your interest (top left of page) with AAIS for more information.